With a fine DAB radio, great quality Bluetooth streaming and a fresh design, the Pure Evoke D6 threatens to become an all-in-one hi-fi box for the modern age. Hasn't every kitchen in Britain at some stage had a Pure DAB radio on the windowsill? Pure Digital virtually invented the DAB radio market over a decade ago and it's dominated it ever since, but early adopters of DAB are now replacing those first forays into digital, so it's about time the famous Evoke line-up got a proper refresh. That's definitely the case with the Evoke D6, which was selling for £179.99 at the time of review. It adds not only wireless Bluetooth streaming but also stereo speakers packed inside a 300mm-long chassis of real oak veneer. The Evoke D6 is a thing of beauty, a great example of modern product design with a valuable lightness of touch, but it's packed full of features, too. The front is clean, with five preset buttons ranged above controls for source, timer, alarms and a menu toggle, while the touch-sensitive SnoozeHandle on the top is good for an early morning slap. There are trademark Pure design flourishes on the retro knobs; one for controlling the volume and another for selecting the radio station or menu item. Above those is a small LCD screen that displays the time. On the rear, meanwhile, is a headphone jack and a 3.5mm aux-in for hooking-up almost any audio device you can think of. Weighing a seriously heavy 2kg and measuring an ultra-wide 300 x 100 x 154mm, the Evoke D6 isn't exactly portable, yet there is technically a way of making it so. Pure makes the optional rechargeable F1 ChargePak, which costs about £30 and gives the Evoke D6 an incredible 65 hours of cable-free audio performance. That's quite something in theory, though the Evoke D6 is simply too heavy to travel far. The package also includes a small credit card-sized remote, which is a nice option, though it's not strictly necessary to operate the Evoke D6. The Evoke D6 has three tuners inside of it; FM, DAB and DAB+. Inside is an integrated 20W digital amplifier, which together with the stereo speaker drive unit deliver some excellent sonics. Some music streamed from an iPhone's iTunes app definitely benefit from the stereo treatment – something that DAB radios too often ignore in a bid to be compact – while the long, open chassis gives the music room to breathe. It's always warm, with plenty of width and mid-range, while treble peaks are precise. That skill helps speech radio sound marvellous, too. The provision of two excellent speakers brings stereo to the tabletop DAB market, with good quality, reliable Bluetooth streaming lending the Evoke D6 a valuable all-in-one feel. Could it replace a hi-fi? Absolutely. The design is clean and fresh, the radio's core functions are easy to use, and the sound quality is warm yet precise. That said, I'm not convinced that a 2kg radio needs a portable option, though it does at least have a fine handle to aid portability. 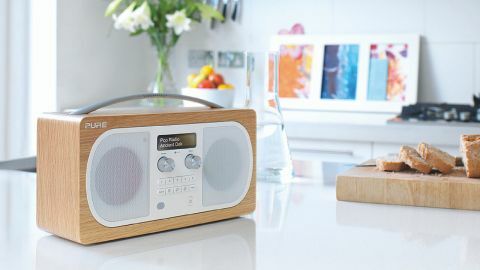 Ultimately, Pure has once again come up with a fine DAB radio, though with great quality Bluetooth streaming and a fresh design it threatens to become an all-in-one hi-fi box for the modern age. It's decent value considering both its stereo speaker array and the price of the competition in the tabletop DAB/hi-fi market, the Evoke D6 boasts a marvellously warm, detailed sound and an excellent build quality.